Is it hot in here or is just me? JUST KIDDING! But, really, it’s been getting hot up in the Shaw Kitchen this past week and for good reasons. Last weekend we visited the local farmers market and picked up a plethora of jalapenos, habaneros and serrano peppers…#spicy! Not quite sure what I was going to do with 20 jalapenos and 15 habaneros, I took our new found friends and entered the kitchen with a pen, paper and mission in mind. It’s no secret, as I mentioned in my Sweet Potato Chili recipe, Wayne and I are OBSESSED with hot sauce, spicy condiments and anything of the like. Unfortunately though, when trying to lead a heart healthy lifestyle, high sodium consumption is frowned upon. With hypertension going hand in hand with heart disease, decreasing ones intake of sodium is highly recommended to help lower blood pressure and improve your heart health. With Valentine’s Day rounding the corner, I decided I would surprise the Mr. with his very own, #simpleswap Sweet & Spicy Habanero BBQ Sauce! Wayne and I have never been big into the gift giving for the Hallmark Holiday, but absolutely LOVE doing small things for one another to show our appreciation. I knew if I could pull this one off, I’d score big time in marital points! Having made BBQ sauce about a month ago for my first time, I knew I needed the staples (ketchup, brown sugar, Worcestershire Sauce, and vinegar). 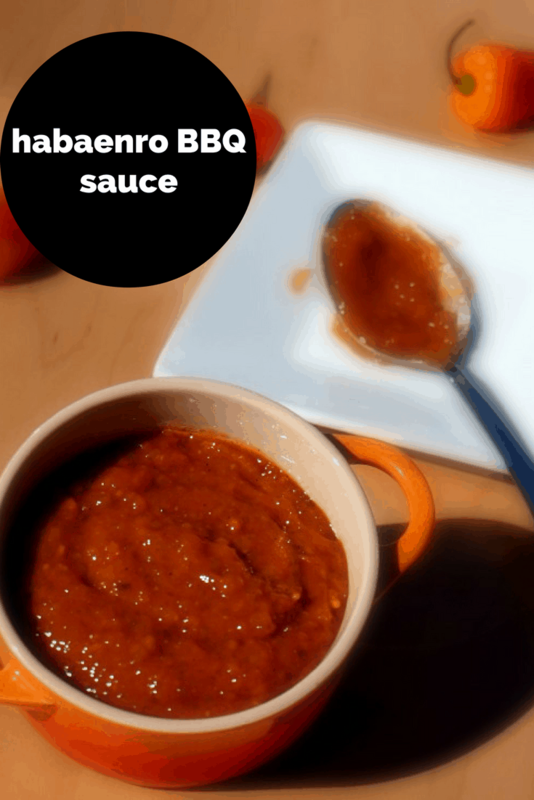 But, because I knew I wanted to infuse the habanero flavor into the sauce, I didn’t want it to be so hot it was unbearable. I was determined to find the perfect balance of spicy and sweet to create that to DIE for flavor. After a pinch of this, and dash of that, and a whole lotta love, this #simpleswap original recipe was created! Ready to get your grill on? 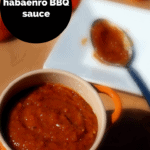 Try this Sweet & Spicy Habanero BBQ Sauce. In a medium saucepan over high heat, combine vinegars, water and peppers. In a separate bowl, combine spices and corn starch. Turn to medium heat, combining ketchup, mustard and brown sugar into pan. Slowly stir in spices and cornstarch mixture, mixing continuously to avoid clumping. Heat for another 10 minutes on low. Transfer to food processor and pulse for 1 minute. Return to saucepan and heat on low. If desired consistency is not reached, add 1 tsp flour at a time to thicken, stirring continuously. Store bought BBQ Sauce racks in over 500mg of sodium per 1/4 cup serving, however sadly the sugar content is roughly the same in both. To lower added sugars, make your own ketchup using pure tomatoes with no added sugars! Though the sugars in here could use a little work, I will boast that this sauce is low in sodium and made of all pronounceable ingredients… which in my book, that’s a win! Not sure what to use this on? Try topping your burgers, chicken or heck, even tofu with this bad boy. The hubby even mixed a tablespoon with some Ranch Dressing to kick his salad up a notch… see, endless possibilities! I LOVE hot sauce! I swear half my fridge is hot sauces 🙂 Can’t wait to try this one with habaneros- what a cute idea for Valentines Day! Oh I like it hot so this is my kind of bbq sauce! Sounds delicious! Woohoo! Fire up that grill and get your BBQ on 🙂 Enjoy! Firey, but I love it!!! LOL- it’s the good kinda burn! I have some habaneros I wasn’t sure what to do with, and this is the perfect solution!